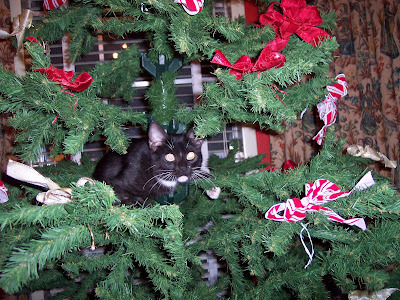 This was the twins' first Christmas. When my brother and his wife came over, my mother and I were in the kitchen working on dinner, and we put a blanket on the floor so that the twins could play safely while we watched. There are pictures and home movies of my brother and me playing on a blanket in that same corner of the kitchen from thirty-hmm years ago! Then we all moved into the living room to open presents. The twins, being too young to rip open wrapping paper, had to watch while their parents opened their gifts for them. Then we propped the gifts on their tummies, so they could better appreciate them. 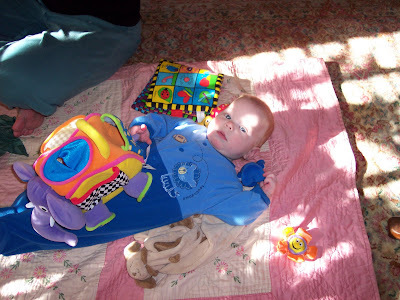 Here's Jack with a soft "book" behind him and another toy. Sam was pretty tired, and slept through most of the proceedings. From when he was first born, I thought that he reminded me of a character in a children's book, but couldn't put my finger on what it was. 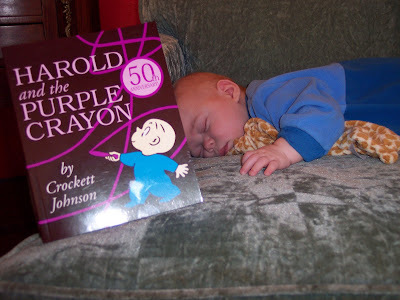 I found the book while doing my Christmas shopping this year, and it's "Harold and the Purple Crayon." I propped it up next to sleeping Sam. How cute that Sam's wearing a blue onesie just like Harold! When you put something off, even something fun, it can acquire the weight of a prison sentence, which in turn encourages further putting off. The whole process can be very off putting. But after repeated comments from a friend, who today claimed that anyone who might at one time have been interested in what I write here had long ago lost interest due to my not posting for three months, I thought I had better post something, anything just to break my non-posting habit. So here it is, a post about not posting. And an outline of my future posts, in which I would like to go back and fill in the last few months and write about what I have been doing. The initial procastination began because I felt I should be preparing for ACL Fest by listening to the bands that would be playing so that I would appreciate their sets more. Then the fest itself was time-consuming and exhausting, and shortly after that I took a week-long trip to Florida, which trip did not start out nor unfold as planned, and which was accompanied by quite a bit of unnecessary drama and sturm und drang, although it was worthwhile overall. I promptly came down with a bad cold upon my return, and spent the whole weekend in bed, emerging only to attend the Rolling Stones concert here, which was lots of fun, and at which I took lots of photos and a few mini-movies. I know I can post the photos on Blogger, but I'm not sure about the movies. I'll probably have to use YouTube, which has been swallowed up by Google since I last posted. Work was very busy after that, and then, even though I got a flu shot, I came down with a really bad cold yet again, and this one kept me in bed and coughing for a whole work week and over a weekend. It's really rare for me to be sick enough to miss work for four days in a row--in fact, I don't think I've ever missed that much due to a cold. I seem to have shaken the cold now, but a neck/back/shoulder problem that was bothersome but not terribly painful except when I coughed or sneezed suddenly came to the forefront, and I finally admitted the severity of the problem and went to see a physical therapist last Friday. I did the exercises he gave me, and it did improve the problem; the trick now is to keep doing them and prevent a relapse. Simple activities such as sleeping, driving a car, and sitting at my desk at work all seem to exacerbate this feeling that my left arm is out of joint and needs to be popped out or back into place. It's that feeling that it's almost right but not quite that's really frustrating and excruciating. I have a North University Neighborhood Association (NUNA) meeting tonight, and I've had to miss the last several meetings due to work conflicts, so I had better go to this one. À demain, tout le monde.